Subject: How do I perform Query, Excel Export, Quick Print, etc.? 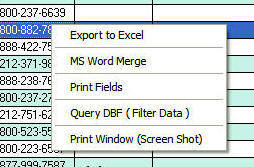 When you view a data like the Airlines List, right-click the mouse on the list area, a pop-up menu will be displayed. Field list: These are the fields you base your search (query) on. Double click select the field. Conditional Operators: For example, Equals, Contains, Greater Than etc. Click on the button that you desire, like Contains. Value: value of the field. Boolean Operators: AND, OR. These are used to combine conditions. For example CITY = ‘ABC TOWN’ AND LAST NAME = “MARKS” Query Text Box: Click on Execute Filter Expression. , when you are done with entering the query condition, If the condition is invalid, a warning is displayed. (You have unlimited undo levels to correct mistakes). Open driver list, right click mouse on list and select Query from the pop-up menu. You select the field name from drop down list. The fields are filled automatically based on the database used. Then select your comparison option. Then you type the value in the Value field. Note: Dates must be entered as MM/DD/YYYY or local date format for country of origin. Logical fields must by entered as: Y or N which mean YES and NO respectively.